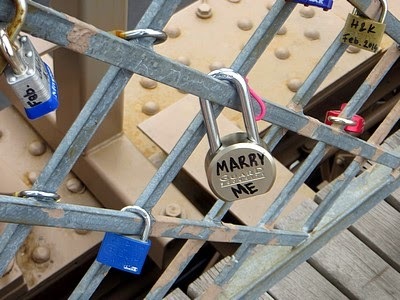 Locks of love on the Brooklyn Bridge. 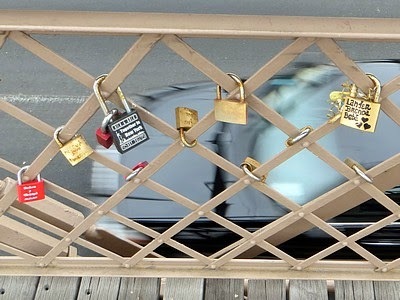 In my walks across the Brooklyn Bridge and back over the past year or so, I've noticed that couples have been writing their names on padlocks and attaching those locks to the fences beside the pedestrian walkway, as shown in the photo above. Sometimes, a lock displays a plea instead of an acknowledgement of existing commitment. 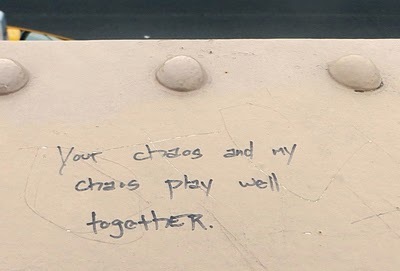 Some messages are too long to put on a padlock, so they get written on the bridge itself. Addendum: this tradition seems to have started in Paris, where the Pont des Arts has become endangered by the weight of the locks. A reader says it has spread to Germany. Lots of European tourists take the walk across the Brooklyn Bridge, which may explain how it got started here. This morning, I thought I heard a DJ on WQXR say, "Today is the birthday of Aaron Copland." Either he was misinformed, or I misheard, as two sources have told me he was born on November 14. Anyway, since I'm a great Copland fan, I decided to go ahead and post something of his. I found the clip above of a portion of his Clarinet Concerto, performed by the Los Angeles Philharmonic Orchestra, with Copland conducting, and with solo by the greatest jazz clarinetist ever, Benny Goodman. It ends abruptly, but what it gets is good.